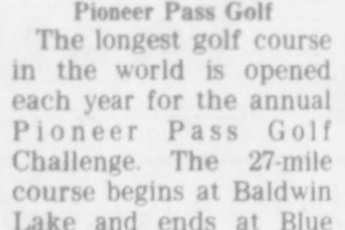 The longest golf course in the world is opened each year for the annual Pioneer Pass Gold Challenge. The 27-mile course begins at Baldwin Lake and ends at Blue Skies Country Club in Yucca Valley. This year’s 22nd annual version kicks off Friday with a no-host cocktail party and rules discussion at Blue Skies. 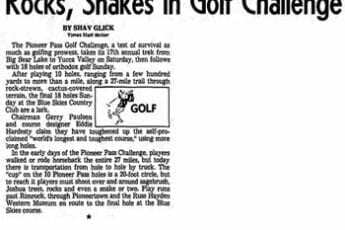 Then after a 6 a.m. breakfast on Saturday, the 60 entrants will be transported to Baldwin Lake for a day of shooting holes that range in length from a few yards to 1½ miles. Spotters and judges will accompany the players. 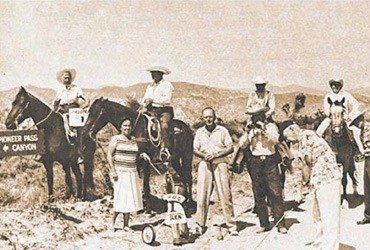 Spectators can catch the 8th hole at Pioneertown’s Hayden Ranch at noon. On Sunday, a traditional round of gold will be played at Blue Skies.